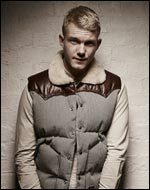 You might know Ed Drewett as the voice on Professor Green's Need You Tonight, and the co-writer of The Wanted's All Time Low. But if you do, don't hold it against him. Along with Example and Plan B, Ed is spearheading a movement that says "pop music isn't just for girls and gays, it is also for geezers who drink pints and shag birds" (the slogan could do with a bit of work, admittedly). It's one of the most refreshing trends of 2010, sweeping aside 10 barren years where every male artist was trying to be Eminem or The Streets without the wit, the life experience or the chainsaw. Ed's debut single, Champagne Lemonade, is co-written produced by Xenomania refugee Tim Powell and is largely a good thing. Best bit is the snarky refrain of "he buys you champagne, I buy you lemonade, makes him somthing of a casanova". Setting the video in a driving range is a nice twist on the lyrics - but I'd have liked it even more if Ed had tried to emulate Fred Astaire's golfing moves.